The Spanish drink a lot of beer. 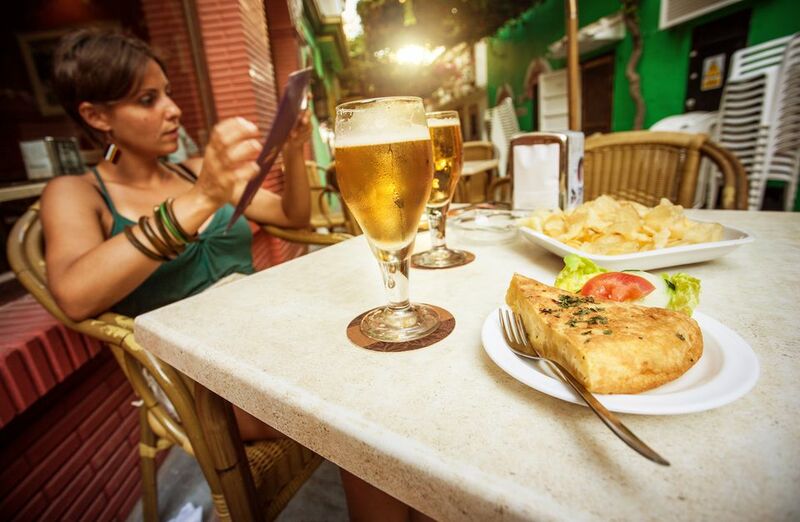 Most beer in Spain is between 4% and 5.5%. A few are stronger, but none are any weaker. Most bars in Spain will only have one beer on tap (though some will have a standard lager and a non-alcoholic version, while a few others will have a pale lager and a dark one). Beer, on the whole, is sold in very small glasses in Spain. But it isn't all bad news. The Spanish like their beer very cold, you might even be served a glass that has been kept in a freezer! Spanish beer has a bad reputation that is only partly justified. Spain has two very bad beers. Unfortunately, about 90% of bars in Spain seem to sell these beers. Read on for information on which beers to go for and which to avoid. Caña: Invariably the smallest beer that a bar normally sells. Could be a wine glass, could be something resembling a brandy glass, or it could be a tiny thing, a bit smaller than a half pint glass. Weights and measures evolved in an interesting way in Spain! In the Basque Country, you can get a zurrito which is even smaller than a caña. In Leon, order a corto to get the smallest beer (this is especially useful if you are eating the city's free tapas as you get the same amount of food no matter what size beer you order). Botelín de cerveza: A smaller, 6oz bottle of beer. Not available in all bars. Jarra or tanque: Usually the largest glass they'll have, normally about a pint. Confusingly, a 'jarra' might mean a jug which is served with glasses and shared (unless you're feeling extremely thirsty!). Not available in all bars. Craft beer has hit Spain! Most cities in Spain will now have a craft beer bar, and many more youth-orientated cafes will have a small selection of local bottled beers. But many bars don't offer much of a selection. It's not unusual to see a bar with only two taps, and one of the beers will be non-alcoholic! Look out for Estrella Galicia in the north, Estrella Damm in Barcelona, or Mahou Clasica in Madrid. Unfortunately, in the south, you'll be stuck with Cruzcampo, one of the worst beers in the world. These are the culprits behind Spain's terrible beer reputation. Standard San Miguel (not the Nostrum version above) is gassy and unpleasant. It is marketed around the world as a premium 'continental' lager but it is simply Mahou's 'other' brand. Cruzcampo is gassier and more unpleasant than San Miguel. More dark beers are popping up in Spain, especially in the north. If you aren't keen on pale lager and prefer darker beer, try Amstel Oro, Mahou Negra, Alhambra Negra, Bock Damm, Voll Damm, and San Miguel Nostrum. The best place to get foreign beer in Spain is an Irish pub which will always sell Guinness and will often sell a variety of other beers. Belgian beer is popular in some Irish pubs as well as in a few international bars. You will find Heineken widely available, while Carlsberg and Kronenberg are quite common in the Basque Country.